I showed up to the event Saturday morning to find buses unloading groups of students raring to go. It was the SkillsUSA regional competition hosted by Frederick County’s Career and Technology center and there was excitement in the air, the same sort of excitement you would experience at any football, baseball or basketball game. It was time to play, time to show what you were made of and time to compete to be your best. The school was bristling with activity; everything was prepped up, set up and washed up for the competitions that would take place on & off site. Everyone displayed enthusiasm and eagerness to take part in this special event. Registration began at 7:15am, the contests began at 8am with lunch break at 11am, the completion of all contests at 1:30pm and the awards ceremony at 3pm. 15 different contests were held on site in various classrooms; Automotive Service Technology, Carpentry, Commercial Baking, Cosmetology, Culinary Arts, Digital Cinema Production, Electrical Construction Wiring, Esthetics, First Aid/CPR, Nail Care, Nurse assisting, Plumbing, Technical Drafting, Television (Video) Production, Welding. 3 contests were held off site; Sheet Metal, Crime Scene Investigation and Criminal Justice. 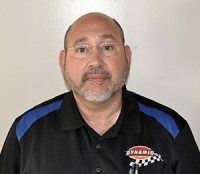 Getting down to brass tacks, the Automotive Technology Department had started to setup at 6:30am with this ye ar’s Chairman of the automotive competition, Lee Forman of Dynamic Automotive. Yours truly, Jose Bueso of Dynamic Automotive acted as the official time keeper which entailed blowing a car horn at the end of every session and break. One of the official test observers floated into our area during testing and almost jumped out of her skin when I lit up that horn at the end of a session, what a fun job. 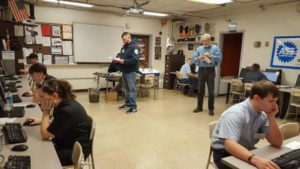 10 Judges consisting of Alumni, Master Technicians, Shop Forman’s and Service Managers from Dealerships, Independent Repair Shops and Vocational Schools were present to grade, assist and guide students through the process. My thanks, to those who take time to give back to our community and our profession, together we are building a stronger and smarter workforce for our country. 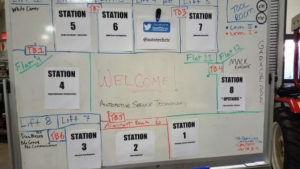 The first test was the electronic service information test which took 1 hour to complete in a classroom on a computer station. 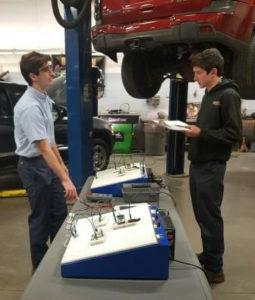 The following 7 tests were taken in the shop with students rotating from one station to another, each of those tests are allotted 15 minutes to complete with a 5-minute break in between. Judges observes intently as each student took on the new challenge of the task set before them. There was no shortage of smiles from both students and proud parents with cameras flashing. When lunch break arrived, I took a walk down the halls observing the activities in the other classrooms. There was an abundance of goings-on throughout the school, my favorite being Culinary Arts. There was no lack of action; wonderful aromas filled the air and eye candy in the form of pastries, cakes and plenty of other delights, Yummy! It was time to get back to Grease. We continued with our competition and finished up the day by taking the group of students to every test station and having each judge describe what the objectives were and how they were graded followed by questions and answers for every subject. I was pleasantly impressed with the manners, professionalism and reactions from each student there. I am proud to say that Fredericks Career and Technology center produced first and second place winners during the Regional competition. Congratulations and good luck to you at the State SkillsUSA. I thank Instructors Gary Wilfong and Tracey Hicks who work tirelessly to make the event a success for all involved. As a matter fact the entire CTC faculty did an amazing job hosting this year’s regional SkillsUSA conference. Job, well done. Students are involved with in-school competitions, the winners advance to the regional level competitions which were hosted by Frederick counties own Career and Technology Center February 4th of this year. The 3 winners of the regional competition advance to the SkillsUSA Maryland State Leadership and Skills Conference, held in Baltimore MD on April 28th & 29th. 42 chapters will represent county and city schools from across Maryland in Baltimore for the event showcasing their skills in as many as 87 career and technical competitions. Then the winners of the state competition from all over the USA and its territories will advance to the SkillsUSA National Leadership and Skills Conference held in Louisville Kentucky, June 26th to the 30th with the total of 16,000 attendees predicted to attend this event. 2016; 20 attended Nationals, 16 placing in top ten. 2015; 20 attended Nationals, 10 placing in top ten, 14 placed in top 20. 2014; 16 attended Nationals, 10 placing in top ten, 13 placed in top 20. 2013; 15 attended Nationals, 11 placing in top eight, 12 placed in top 20, 1 earning a gold medal. 2012; 26 attended Nationals, 12 placing in top ten, 26 placed in top 20, 1 earning bronze medal, 5 earning silver medals. Welding Agricultural & Comm. Metals Tech. For more information see about Career and Technology Center below. SkillsUSA impacts Students to develop personal, technical and workplace skills that enhance the future workforce of our country. SkillsUSA is a national organization for high school and college students enrolled in Career Educational programs that provides opportunities for developing employment skill, personal growth, leadership and technical skills. Mission Statement: SkillsUSA’s mission is to empower its members to become world-class workers, leaders and responsible American citizens. A partnership between the Career and Technology center (Teachers Guidance Counselors & Advisors, and Administrators), local business professionals, students and parents is form to develop student’s skills and awareness in the field of expertise they are interested in. 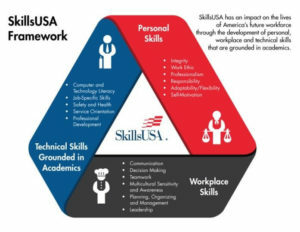 During the educational process students are encouraged to participate within the framework of SkillsUSA which illustrates the mission of the organization to empower members to become world class workers, leaders and responsible American citizens. Please help us support the future workforce of Frederick County through participation in our SkillsUSA fundraising, community service and competition events throughout the year. Information obtained from SkillUSA.org. Please visit site for additional information. The Career and Technology Center is leading the way in career and college readiness. 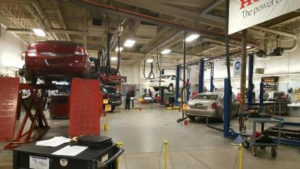 Congratulations to Frederick CTC students Josh Runion 1st place and Trey Zieler 2nd place in the Auto Tech Competition. Good Luck at States!! Jose and Lee of Dynamic Automotive …THANK YOU for your continued support! !